Later today, when you go to www.melodramommy.com it will transfer you right there. Oh, and leave me a comment there and let me know whatcha think. Mommy: "Ok, you sit here and watch TV while I jump in the shower." 2YO: "Mommy, You no need to jump in the shower." 2YO: "You no need to jump (she hops twice) in the shower! You can walk (she models walking) into the shower." Well, there's nothing quite like getting a lecture on safety from your well meaning 2YO. True story. I meant it when I said this is the most entertaining job ever--and tiring. That of course happened after 2 time outs for 2YO and five races after 1YO who was attempting to climb out of the high chair, crawl up the stairs, open the kitchen cabinets, jump in the potty, talk on the house phone, and grab daddy's video camera--all before my morning cup of coffee. 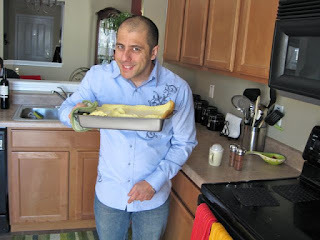 This “Dutch Babies” breakfast recipe, also known as German pancakes, is one of my favorites of all times. It almost tastes like French toast. It is super yummy, extremely easy to make, and looks quite impressive when you take it out of the oven. Recipe: Preheat oven to 420 degrees. Put ¼ stick of butter into large rectangular baking pan put into oven to melt while you prepare the rest. In a large bowl combine 1¼ cups flour, 1¼ cups milk, and 5 eggs. Mix either in blender, or with hand whisk for two minutes until evenly mixed. Pour mixture into pan over melted butter. Bake for 20 minutes. You will see the edges puff up and turn golden brown. Remove from oven and serve with some powdered sugar and nutmeg sprinkled on top and maple syrup. You can also serve it topped with fresh strawberries and a side of bacon. Enjoy! And let me know what you think. Do you have a favorite breakfast recipe to share? Thanks for your continued voting. You mommies out there know EXACTLY what I’m talking about. That’s all it took this morning . . . I woke up tired but became stressed when I discovered baby boy had a fever and Toddler girl royally woke up on the wrong side of her bed. It was a work day for me to head to the office—bad news: daddy would not be able to help get the kids ready or drop them off. More bad news—my hair was drenched in coconut oil that the night before I had brilliantly decided to sleep in for an extra special but now very inconvenient hair treatment. So, I showered while baby boy sipped his bottle in his crib and I continuously rubbed the steam off the shower door to keep a close eye on Toddler girl who was attempting to squeeze the entire contents of a lip-gloss tube and use it as a facial moisturizer. Well, things can’t be that bad. Right? Right? That’s what I thought as I loaded the kids into the car. I strapped baby boy in first. He was screaming for his bottle. Then I lifted Toddler girl into the car and tell her to sit in her car seat and wait. She actually usually always listens. I’d be right back to strap her in. All I had to do was walk 10 feet from the garage to the hallway side table where I had left his bottle. But, a lot can happen in 30 seconds. The hand sanitizer. That bottle that I had placed in the front seat JUST yesterday so I would remember to pack it in my bag—was not on the seat when I returned! It was suddenly in the back seat! And Toddler girl was climbing back into her seat, revealing she was up to something. "What did you just do?" I asked Toddler girl, only for her to tell me she thought she would “wash” her baby brother’s face with it! "YOU DID WHAT!" It was smeared on his cheeks—and feet! He just sat there, the innocent victim, amused by the tingly cool sensation and the attention. The problem? Just a few months ago I was forwarded an email warning that children can ingest hand sanitizer—all it takes is a few drops--and get poisoned from it. Since then I have been so extremely careful to keep it all out of their reach. (It's an interesting article to read and one to take into consideration.) Until now! That feeling of dread weighed down in the pit of my stomach and intoxicated my mind, my heart, my body with fear. What if Baby boy got some sanitizer in his mouth? What if he’s poisoned? So I frantically investigated him head to toe—thankfully it didn’t appear so. I further interrogated Toddler girl—things were aligning. He appeared safe. But, the fact that Baby boy was already a bit lethargic with his fever only made me feel more anxiety that perhaps, no it couldn’t, but could it be that he got a drip on his mouth! My mind said he was completely fine. But my emotions ... well, if you didn't read the post about my brief hallucination of how Toddler girl's fall at the playground led to her detached arm, you should, and then imagine how much more I am freaking out in this moment. Thankfully that was not the case. Baby boy was fine. I am EXTREMELY thankful and relieved. This was another learning experience--I have since banished the hand sanitizer from the car. And, I have resolved to NEVER leave Toddler girl in the car unstrapped---until she is 18! I wonder if they make car seats big enough for teenagers? And, by the way, I did have to leave work early and bring baby boy to the doctor—thankfully it was not a return of his ear infection, but just a virus. Though I’m hoping it’s only teething. So overall, Thursday, gets the award for my most stressful day of the week. And that's a good thing, because it means tomorrow can only get better. Right? Right! Happy Friday Everyone : ) Hoping it’s a peaceful start to a great weekend for you all. Do you have hand sanitizer in your car or diaper bag? If not where do you keep it? OR what do you use to fend off the germs. Like my blog? Support me by voting to the right of this post. It only takes a click and it makes my day. 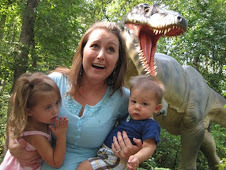 We're still #2 in humor and a few votes shy of being in the top 25 overall in the Top Mommy Blog Directory. Today is my last post participating in Momalom's 5 for 10. The topic is "Yes." Have you ever considered how many job descriptions a woman takes on when she says "yes" to becoming a mother? CONTACT: Find me anywhere you hear or see children; sometimes I wear them too. PHD, Praying hard daily, how else do you survive the BA and MA? HONORS/AWARDS Finalist in the Semi Annual “My Baby Can Scream Louder Than Yours So-Please-Help-Me Jesus contest”; The Nursing-Mother’s “So This is What it’s Like to be a Cow” Award; “I’ve Sniff Bottoms More Frequently than a Custom’s Canine” First Place; “My Baby’s Head is a Lethal Weapon and I Survived Sleeping Next to it” Honorable Mention; Qualified to join the “I Abused my Diaper Bag to the Point it Exploded” Club. I write my own awards. Chief Household Officer (CHO), To see a full list of my daily responsibilities click HERE. Hazmat Specialist, I consistently identify, quarantine, and properly dispose of more hazardous waste in one week than an entire hazmat team in a year. Translator, I am fluent and proficient in translating Toddlerese. Personal Chef, I not only prepare and serve three meals a day, but snack times too. Professional Gift Wrapper, my clients specialize in making their own unique “presents” multiple times daily. I excel at quickly, and carefully wrapping these gifts with many layers of plastic one handed, and sometimes at night with only one eye open, all while holding my breath for very long periods of time. Potty Training Doula, I’ve coached my patients in birthing more poopies, than a pediatrics ward has babies. Driver & Tour Guide, encouraging safety first, I personally lift each client into his/her seat and assist them getting their entire body strapped into the car all while serenading them with many popular songs, such as “Twinkle little start,” though out the drive. I even narrate and give detailed descriptions of the various locations we pass through. Wrestler, how else do you suppose I would get my youngest opponent diapered, bathed, dressed, and fed? Heavy Weight Lifting Champion, yes, that’s what I call someone who functions throughout the day while carrying two human beings under each arm pit, keeping in mind that after the first five minutes, everything becomes heavy. Surgeon and Real-life “Operation Game” Champion, who needs that game of Operation when one can extract play dough, Cheerios, penne pasta, and crayons out of a moving target’s nose—This brings the careful navigation of a surgeon’s swift steady hand to a whole new level. Personal Shopper, in addition to helping my clients choose the best products on the market, my clients enjoy a joy ride being pushed in the top front of the shopping cart. Story Telling Specialist, I can recite “Brown Bear” and “Good Night Gorilla” by heart, backwards, forwards, and in my sleep. That’s what happens when you’re asked to tell the same story over and over and over again. Dental Hygienist, while brushing my patients teeth, offer two flavors of tooth paste, including the fluoride free bubble gum and fruit punch, I even sing the “this is how we brush our teeth song” to my patients! Photographer, I capture that perfect shot of my clients. Yes, I do just about anything to get them to smile, including bribery, praise, and making a complete utter fool out of myself. Inventor, I have used the diaper wipe to do all things, everything from wiping bottoms, noses, cleaning stains of carpets, shirts, cleaning the couch, to cleaning the baseboards of the house to functioning as earplugs. Desperate moments call for creative measures. House Cleaner, it’s a tough job but somebody’s got to do it. Police Officer, I excel at giving warnings, I’m the Time-Out enforcer, and have been told my facial expressions alone instill the fear of God in the disobedient. Personal Coach, I give more encouragement and stickers than Santa Clause presents. Multitasking Expert, I can nurse a baby while talking on the phone, updating my facebook status, sipping sweet tea, changing the channel on the TV, and chasing after my 2YO—all at the same time. Have anything to add to the list above? Please share. Like my blog? Support me by voting by clicking right, follow me on twitter, and come back! Welcome D-Listed Blog Party 2010 visitors. I have also been participating in Momalom's 5 for 10 post where every day we've been writing about the same topic and today's topic is Lust. But before I get into that, a brief introduction: I'm a dramatic Italian, eye-tearing, germ-fearing, sweat-dripping, heart-skipping, bottom-wiping, finger-swiping, crumb-picking, toy-tripping, hand-holding, laundry-folding, character-molding, head-turning, stomach churning, patience-testing, un-empty-nesting, mistake-making, rule-breaking, Mommy of two toddlers. Check out the "About me" section below to learn more. Well, since I'm Italian, I thought you might enjoy hearing some crazy advice my Italian grandmother gave me upon getting married. One day, shortly after my honeymoon, she called me up on the phone and said out of the blue with the greatest fervency as though it was her last breath, "LISTEN TO-a ME!" I thought to myself, Oh, God, what's happening. Is she dying? But no, the words she was about to say was going to make me want to crawl under the couch and hide. "Listen-a! When de man, you hus'bun, wanna make-a de cha-cha-cha NEVER SAY NO!" "What!" I ask, thinking to myself surely surely this woman, my grandmother, isn't referring to what I think she is! "YOU SO STUPID-A! NEVER SAY NO!" "Grandma, I don't want to talk about this." Can we say, AKWARD! Nevertheless, she continued: "Listen-a. I'm gonna tell you da story. Dis is-a true! One time, dare wassa da woman. Her Hus'bun he come-a 'ome from-a work-a, and he wanna make a de cha cha cha. But she said-a NO! She was-a busy-a cook-a! She no wanna de cha cha cha! So de man, he go-a into de bed-a-room. Den, some-a time pass-a. De woman went to call-a de husbun to eat-a dinna. But when she open de door-a, de husbun, HE WAS-A DEAD-A!" SURELY, I thought to myself, this isn't really happening. This advice surely isn't coming from my grandmother. "What are you talking about!" I tell her. "This is so random. Please, I don't want to talk about this Grandma!" But she insisted, "Look-a, NEVER SAY NO! Dis is de cross-a we must-a carry as de woman." "Are you telling me that if I ever tell my husband no, he's going to die?" "What-a you? Some-a kind-a CRAZY!?!?!?!?! Yes-a! Dis is de true story!" Well, there you have it ladies. Advice from my Italian grandmother: "Never say NO" to your husband's requests for "dance" lessons. I did ask her what would happen if the husband says no to his wife. Apparently the wife will not die. Don't get angry at me, now. I'm just the messenger. Like my blog? Share the love. Leave a comment, vote clicking to the right of this post, follow me.